The demand for energy world over has been rising steadily since 1970 and the major contributors to this rise are growing economies like India and China. It is only nuclear energy whose demand is not growing, essentially due to plateau in demand of the developed countries and growing economies getting subjected to the restrictive regimes like NPT. Rise in demand can be explained as too many claimants for the same pie with attended implications. Source: Energy Information Administration (EIA), International Energy Outlook-1999. 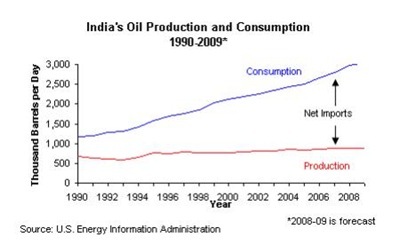 India’s energy consumption is growing at the rate of 5% per year. 3 Presently, of this demand, 40% is oil and natural gas, which is projected to grow to 45% but the domestic production, is likely to remain stagnant at 32 million tons. Such a state calls for heavy dependence on import (in excess of 80% of the demand) resulting into heavy drain on foreign exchange. One of the major dilemmas for India is that adequate resources (petroleum) are not available for commercially viable technologies and the resources that it has (Thorium, renewable and gas hydrates to name a few) technologies have yet to mature. Affordability of the cost of energy by the weaker sections of the society. Unreliable energy distribution system and effect of energy theft (about 40%) on the supply. Use of inefficient traditional energy resources like cow dung and wood in large parts of rural India, which cause health problems to women folks in villages. Need of growing personal transportation segment (rate of yearly growth 16% since 2001) which needs scarce petroleum products. Restrictive international regimes for energy resources and effect on supply due to needs of other growing economies like China. Resource Richness of India - Although, India is well endowed with natural resources, there is deficiency of energy in the required form to meet its developmental needs. Some of the resources unique to India are: wind energy in a number of coastal, desert and mountainous locations; warm waters of her seas have a scope for exploitation of maritime resources; sun’s intensity is one of the highest in the world, which has potential to meet a major portion of her energy demand; high temperature and high humidity in a large part of the country lends itself for biomass conversion; coal reserve which is one of the largest in the world (adequate for next 200 years at the present rate of consumption); large number of rivers collectively have a very substantial potential for hydroelectric energy conversion and a very large reserve of Thorium has potential to produce nuclear energy. Prospected Natural gas though not in abundance but is not too less either. 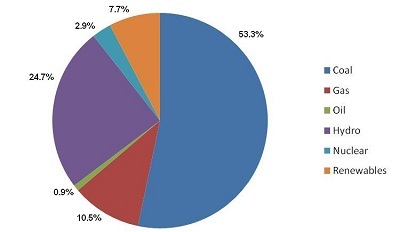 As is evident from the graph, the energy mix is dominated by coal-fired systems to the extent of 75%. Presently nine numbers of 4000 MW coal fired power plants are under construction and are likely to be completed in next five years. Coal Sector needs major investments for extraction and transportation and high ash content of Indian coal needs to be addressed by leveraging technology. There is also a need to diversify the sources of electrical generation keeping in view the projected demand for electricity in the medium and long terms. Need To Review Energy Mix - India has to choose its own mix and proceed accordingly to create necessary infrastructure to utilise that. A practical approach would be to exploit optimally all available resources by leveraging technology and under the concept of ‘local use with provision for transfer of surplus power generated’. Need for Research and Development (R & D) - With the rapid advances in the field of technology and many of the commercially viable resources being finite in nature a robust Research and Development infrastructure is absolutely essential to keep exploring newer areas of resources for their technical feasibility and developing the necessary economically sustainable technology to exploit them. Other areas which need R&D are transmission, storage and technical systems and procedures to ensure inter-changeability from one source to the other source. Remote Power Generation - This is important in India as many rural locations lack regular access to grid power and local population has to depend on local resources. In 2004, 69% of India’s population relied on biomass for cooking. Transportation Sector- There have been some moves by a number of companies to introduce battery-powered bikes (e.g. Ultra Motors, who have produced over 100,000 units in two years). The power requirements of bikes and scooters is being planned to be met by the Direct Methanol Fuel Cells (DMFCs) or hydrogen-powered Proton Exchange Membrane (PEM) fuel cells. The large potential market for fuel cells in India raises the prospect for significant economies of scale in the commercialisation of the fuel cells. As far as future is concerned, eventually, plans are afoot to move away from CNG to the use of hydrogen in internal combustion engines, and eventually to install fuel cells. Also there is a plan, to make all government vehicles run on CNG, again as a preliminary to establish an all-hydrogen fleet. A project for the introduction of hydrogen- CNG blends on a trial basis in existing CNG vehicles is currently in the planning stage. Indian railways have plans to build a hydrogen fuel cell powered train. In both public and personal transport, some preliminary activities are on-going in hydrogen/fuel cell development. Role of Conservation in Demand Management- While, it is important to enhance the availability of the energy but equally important is to do conservation to ensure optimal utilisation of available resources, reduction of wastages, maximisation of passive means to reduce the demand. Such an approach will entail recycling and co-generation in Industry across the board. For habitat; addressing aspects like orientation/ design of buildings, use of materials which lent themselves for energy conservation/ recycling of energy, rain water harvesting to reduce the energy consumption on pumping effort, afforestation which helps in reducing need for air conditioning effort, exploiting energy from kitchen waste and finally use of standard equipment for energy conversion is required. Economics of Power Production - A KPMG report in 2007 said that India needed to spend US$ 120-150 billion on power infrastructure over the next five years, including transmission and distribution (T&D). It said that T&D losses were some 30-40%, worth more than $6 billion per year. A national average of 27% T&D loss is well above the target 15% set in 2001. In 2006 almost US$ 9 billion was committed for power projects, including 9.35 Giga Watt electricity (GWe) of new generating capacity, taking forward projects to 43.6 GWe and US$ 51 billion. At the end of 2011, 180 GWe was on line. The government's 12th 5-year plan for 2012-17 is targeting the addition of 100 GWe. The International Energy Agency (IEA) estimates that India needs an investment of at least $ 135 billion to provide universal access of electricity to its population. International Pipelines - There are two pipes namely; Turkmenistan-Afghanistan-Pakistan-India and another Iran-Pakistan-India are on the anvil. Transportation of Natural Gas - needs heavy investment for creating infrastructure on both ends for liquefaction and re-gasification. Need to Establish Equation with Turkey - With a view to exploit Caspian Basin which is estimated to be having 16-18 billion barrels of oil. Establishment of Strategic Reserve - Planned infrastructure for a capacity of five million tons spread over three locations needs to be expedited. Acquisition of Energy Equity Overseas - with arrangements for their security in location and during transit. Need to Diversify Energy Mix - from fossil fuel to other sources like; renewable, hydro, bio based fuels and nuclear. For hydro energy cooperation with Nepal and Bhutan is absolutely essential and emphasis needs to shift from Mega projects to small hydro projects. Development of a Logistic Network - with in the country to cater for movement, storage and supply chain management. Energy be declared a strategic asset and all out efforts; technical and diplomatic be made to ensure its continued availability at all times. Optimum utilisation of all the possible resources like waste, geothermal, sea based. Transfer of energy from energy surplus areas to energy deficient areas and utilisation of energy resources locally as far as possible. Energy to be an important subset of the foreign policy. Establishment of an inter-ministerial mechanism with due linkage with industry to scout and procure energy bearing properties abroad and address related issues. 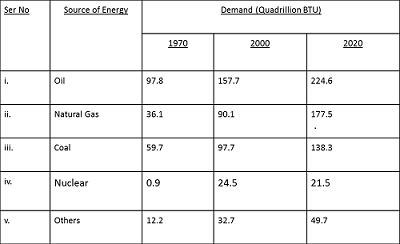 Energy pricing, demand/supply management be market driven rather than government administered. Strong Emphasis on R&D - to exploit clean coal technologies, gas hydrates, Hydrogen and fuel cells and other frontier technologies. Extra efforts are needed to reach maturity of technology so far as breeder reactors are concerned. In a planned manner use of blending of petroleum products. Indigenous Capacity Build-up - for training; industrial base and management skill pool. Need to address ratings of equipment, systems integration, losses in the distribution network, improvement of infrastructure with adequate redundancy.